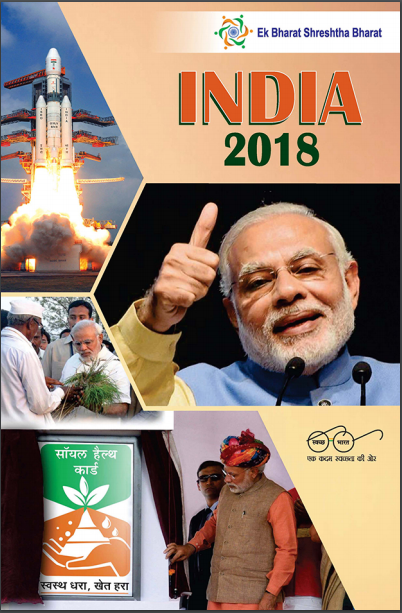 India 2018 or Bharat 2018 is a reference annual Book published by Publication Division of the Indian Government. The reference book is an authoritative compilation of the complete information for 2017-18, about the current affairs of the country, which includes important dignitaries, state policy, public schemes and important data related to demographics, trade, economy and others. Bharat 2018 is a government publication and hence the information presented is authentic. Thus this book can also used as a reference source by researchers, media and reputed publications. The book is brought out on a yearly basis and updates all the data related to development in the country regularly. Information ranging from urban to rural India, industry to infrastructure, art and culture, technology and science to economy, health, defence, education and mass communication is put together. Information about sports, national events and international events having relevance to India are also presented in this book. The sections on Current Affairs and General Knowledge portion presented in India 2018 is one of the most authentic information source as it is officially stamped and released by government publishing house. A clear, precise and updated population table even presents the latest population estimates of the nation, for a census is only done once in a decade. Although the book contains much information about the working of the Government, its functioning and its various agencies, it is written in easy to understand language that is precise and updated. Apart from being the most reliable source of information and knowledge about the workings of the Indian Government, the book also considered to be a Bible of facts and figures for those competing at the UPSC conducted examinations, be they the civil services examination (IAS, IPS etc. ), Indian Economic Services, Indian Military Academy or other competitive examinations held regularly for national and state services jobs. The Publications Division, a media unit of the Ministry of Information and Broadcasting, Govt of India, is one of the leading publishing houses in the country and the largest in the public sector. It aims at publishing quality titles on a wide variety of subjects including arts, literature, culture, science, environment, India’s national heritage as also children’s literature. The Publications Division promotes National Integration by disseminating information and creating awareness about various activities, regions and the myriad cultures and beliefs of the people of India . Established in 1941, Publications Division is one among the pioneer publishers of the country. The Division publishes and sells books at affordable prices through its outlets in important cities and also through agents. It also participates in exhibitions and books fairs to promote the sale of books and journals. Till date, about 8000 titles have been published. At present , four journals are being published , which are – Yojana, Ajkal, Kurukshetra ,Bal Bharti and Employment News.